Moonshiner Lights are great lights for coonhunting, hunting, working on the farm. They are not limited to hunting-useful for many activities. Donald Maggard the owner of Moonshiner Light's put quality and value in all his lights. all you have to do is plug your smart charger into your light and forget about it. DOWN. PUT YOUR BATTERY ON CHARGE AFTER EACH USE. For our other lights , the charger should feel warn to the touch while charging. more than 24 hours. If your light is not in use , charge it once a month. Avoid running battery completely down. To prevent excessive battery drain, we install a thermistor shut-off on all of our lights. 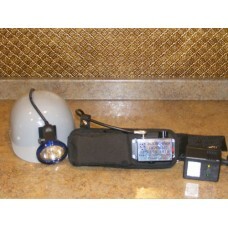 Includes:5100 Head Regular not LEDSmart ChargerHard HatLED Walking LightBeltExtra Bulb 12V32X6 Posit..